Great things await when you choose to sponsor an EveryChild California event! 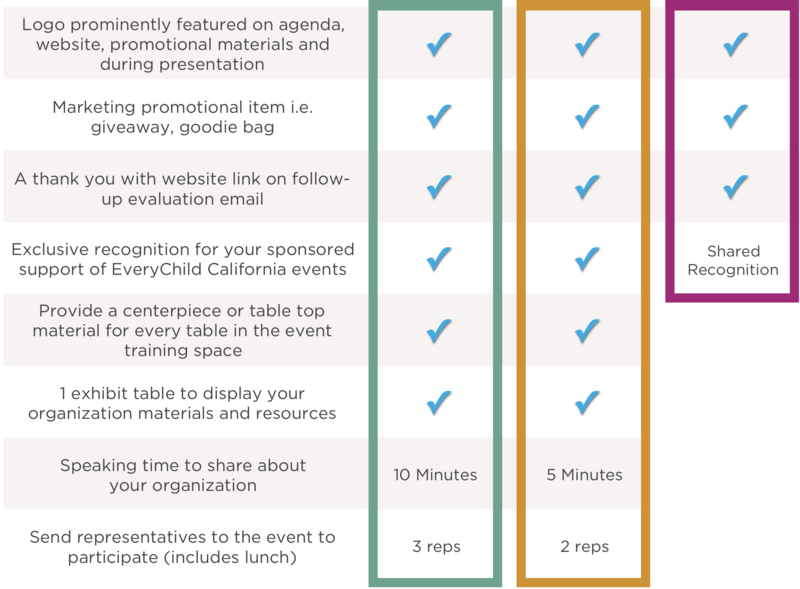 Becoming a sponsor of EveryChild California is an amazing way you can connect yourself with the most prominent professionals our field has to offer. Our sponsorship opportunities are more than just a transaction, it is a way for you to show support for a group of passionate community leaders changing the lives of children and families all throughout California. Become a sponsor today and be introduced to this exclusive group of growing professionals advancing the field of early learning and education! Click here to access the sponsor application! Are you looking for a larger platform to highlight your services? EveryChild California invites you to exhibit and sponsor our annual Fall Technical Assistance and Great Administrators Conferences. Exhibitors and sponsors have the rare chance to showcase their products and services in front of over 400 early child care professionals! Click here to learn more about these events!